Mapping the Yugoslav conflicts – Yugoslavia - What Should Have Been Done? Almost everyone of these is important. But “nation” has to be spelt out. That Yugoslavia was a fragile construction, anyone with the most elementary knowledge of the region would know; including the tradition of extreme violence, particularly pronounced in the B-i-H (1) among Chetniks (Serbs), Ustashe (Croats) and some of the Bosniaks. (2) The analytical problem was actually not why Yugoslavia “fell apart”, given the history of Austria-Hungary/Habsburg invasion and meddling from the Northeast, and the Ottoman/Turkish invasion and meddling from the Southeast. They drew lines, converted and subverted, supporting one group against the other, traumatizing all over. B-i-H was invaded and traumatized by both. The analytical problem was more how post-World War II, Titoist Yugoslavia could manage to keep together at all. Some answers are in the borderland between facts and myths. There is the anti-fascist partizan as Yugoslav archetype; Yugoslav socialism with samo upravljenje (3) that came later; an anti-Soviet posture; a build-up of nonalignment (4) from the break with Komintern June 1948 to the Belgrade conference 1961, so skillfully organized by the late Leo Mates. (5) Millions of Yugoslavs found an identity between West and East, between North and South. Yugoslavia did not fall apart after the death of Tito in 1980 but after the death of the Cold War in 1990 and the implosion of the Soviet Union. (6) Nonalignment between something and nothing was meaningless. And there were economic troubles. And other factors. No country is ready for shocks like that, Yugoslavia less than most. This is a country where the collective subconscious of the major actors to a large extent had become collective and individual conscious: what are deeper myths and traumas to other peoples, repressed and/or forgotten, are here on the surface, comes out readily, and are easily mobilized by leaders whether to promote their own interests or the interests of their nation. Or both. Since the “instrumentalisation of the conflict by cynical leaders” (7) hypothesis has been used by media and politicians a reminder may be needed: there has to be something to build upon in the nation, raw material to be processed, for leaders to unleash all that violence. (8) Take Croats, Serbs and Bosniaks – Catholic, Orthodox and Muslim – in the Northeastern conflict triangle. They are three peoples living uncomfortably close, no longer protected by hills and valleys; chosen (9) by God, by Bog (God) and by Alla’h respectively. They see themselves carried through History by powerful myths: the Croats as the outposts of Western Christianity, protectors against Orthodox and Muslims; the Serbs as the outposts of true, Eastern Christianity and the true protectors of the border (Krajina) against the Muslims. Both of them see themselves as original inhabitants. The Muslims, newcomers in the religious sense, see themselves not only as outposts of Islam but also as the carriers of a higher, more tolerant, more creative culture, easily compatible with the modernity of democracy and human rights. These three nations are not alone in this; many nations and states share such characteristics. But Croats, Serbs and Bosniaks live very close together, particularly in B-i-H, and they seem to bring out the worst in each other. The Serbs may have been the key perpetrators in this recent round. But they were certainly the major victims 50 years earlier, and much of what happened in terms of violence is continuation of the vicious cycles of World War II, in turn continuations of earlier cycles. Violence breeds violence, in space and over time; as always. However, Serbian myths have a special quality. Defeat has come to be seen as natural and normal, but, typical of Orthodox Christianity: in the longer run truth will prevail. The Serbs will be redeemed given their special qualities. History has treated them very badly, and the world is largely a conspiracy against the Serbs. If one more country turns against them that tells more about the world than about Serbia. There is something underneath this self-fulfilling paranoia that also applies to some other nations, like much of Iraq. Defeat being normal does not mean that it serves no purpose. The road to redemption goes through martyrdom, but only if qualities of heroism and courage in standing up against overpowering forces have been demonstrated. The more the world unites against the Serbs, the closer is the redemption. (11) Standard military logic is turned upside-down. Defeat becomes victory. Yugoslavia was a territory governed by states peopled by nations governed by dreams. The borders between states and between nations did not coincide. Serbs made up 12% of the population of Croatia; B-i-H was maybe 44% Bosniak, 35% Serb and 21% Croatian. Their dreams bordered on psycho-pathologies reinforced by cycles of violence. Whoever enters, do not let go any hope as Dante said about hell, but proceed with more care than is usually to be expected from old European colonial powers. The handle on this problem is not only state sovereignty, but also national self-determination, adding the equal right of the peoples of ex-Yugoslavia to self-determination. This means full rights of Croats and Serbs to their own countries, Croatia and Serbia, but no right to deny equivalent Serbian claims in the Krajina region of Croatia, and Albanian claims in their part of Kosovo/a. (12) For B-i-H this means that Bosnian Muslims have the rights to their own state, but no right to incorporate those among the non-Muslim population (12) who do not want to live in such a country. More about this later. 1095: The Christian-Muslim split initiating the Crusades. The two fault-lines were reinforced by the occupation of the Yugoslav Northwest by Habsburg Austria-Hungary and the Southeast by Ottoman Turkey. But the fault-lines are not only, or even mainly, religious: they have political (who rules whom), economic (who exploits whom), military (who kills whom) and cultural (who shapes whom) correlates. “Clash of Civilizations” is as usual an inadequate expression; there is more at stake. Nations want to be self-ruling, many prefer poverty to being exploited, some are killer-nations but most do not want to be killed. Above all, they want to shape themselves, be makers of their own history. The Outer circle shapes the middle circle which shapes the inner circle. Yugoslavia becomes Europe’s shadow (14) and reflex. That Sarajevo where the fault-lines intersect becomes Europe’s epi-center for “Euro-quakes”, is obvious. The population divides into those three parts. That there was an uprising 6 years after Austria/Hungary annexed B-i-H in 1908 killing a throne successor intruding into sacred time (28 June 1914, 525 years after the Serbian defeat in the Kosovo Polje battle, is equally obvious. A foreshadow of sniping. And bombing. And with Srebrenica nearby. That the Inner Circle around the epi-center, B-i-H itself, becomes a cauldron even if some of the population eke out a B-i-H or even Yugoslav identity from bogomil or titoist fragments of history, goes without saying. (15) But during the 600 years from Kosovo to the early 1990s B-i-H was under foreign rule, except for the between World Wars I and II turbulence. There was “peace” under Ottoman, Habsburg, Nazi and Titoist control, and now under NATO/EU. Could it be that B-i-H is simply not viable? That Croat and Serbian centrifugal forces away from the Bosniak center are too strong? That the Middle Circle, Yugoslavia, supports their brothers and sisters in the Inner Circle also goes without saying. Nations create stronger socio-cultural fabrics than states. However, a problem remains. Bosnian Croats have a mother-land in Croatia. Bosnian Serbs have a mother-land, Serbia, which they may or may not join, kept apart like in Mihajlovic/Tito times. But Bosniaks do not have a mother-land anywhere in Yugoslavia. (16) They have only B-i-H.
That the Outer Circle, Europe, Russia, Turkey, support their brothers and sisters in the Middle Circle, who in turn support their brothers and sisters in the Inner Circle, and vice versa, should also surprise nobody. However, a problem remains: the USA. Being Protestant/Catholic, we might expect the USA to support the Catholics, i.e. the Croats. But the picture is more complex. The Bosnian Croats: not to be ruled by Serbs or Bosniaks, probably to join Croatia, the mother-land. The Bosnian Serbs: not to be ruled by Croats or Bosniaks but be independent-autonomous, also of Serbia, as Republika Srpska, possibly on a transversal linking Orthodox, from Moscow to Athens. The Bosniaks, the Slavic Muslims: not to be ruled by Croats or Serbs, aiming for the maximum B-i-H consistent with this goal with a clear plurality, or, as a second best, a mini- B-i-H, the Bosniak part. Under both scenarios contacts with the Muslim world, as part of a transversal linking all Muslims, from Sarajevo to Pristina-Tirana-Istanbul, and from Casablanca to Mindanao. Croatia: to keep the land of the former Yugoslav republic, annexing the Croat part of B-i-H into a unitary Greater Croatia. Serbia: all Serbs should be autonomous, in Croatia, B-i-H and Kosovo. The basic goal was not Greater Serbia but that Serbs should not be ruled from the centers that killed so many Serbs during World War II: Zagreb, Sarajevo, Pristina; all Nazi/fascist allies. (18) But Serbs were handed on a platter to Zagreb, Sarajevo and Pristina through the recognition policies, about the worst that could be done. Albanian Muslims: all Muslims independent-autonomous, within Serbia, Montenegro and Macedonia, possibly also coming together as a Greater Albanian (con)federation. So far, so good or bad. Basically they all wanted to be ruled by their own kind. Except for Albania we are still in Yugoslavia. If this were all a solution was not impossible; and still possible. But it requires time, patience, and mechanisms. So much for the inner and middle circles. Let all get what they want if it is consistent with the equal right of the peoples of ex-Yugoslavia to self-determination. The easiest party to accommodate is probably the Croats: let their part of B-i-H be part of Croatia, if that is what they want. The third party is the Bosniaks, the Slavic Muslims (21). Let them have their independent country inside B-i-H if that is what they want; with no right to take the Croats and Serbs with them. The fourth party are the Albanian Muslims. Let them have their independence-autonomy, including relating to Albania, if that is what they want, but with high level autonomy for the Serbs. The fifth and sixth parties are Montenegro and Macedonia that might agree to autonomy for Albanian Muslims in return for peace. The Slavic Muslims would give up Hercegnovi and the Serbian parts to the Croats and the Serbs, the Croats would give Krajina and Slavonia to the Serbs, the Serbs would give (most of) Kosovo/a to the Albanian Muslims, but retain some cantons. The Albanian Muslims could then give Adriatic access to the Slavic Muslims. A hexagonal deal. Uni-national Slovenia is outside any deal, being self-contained, succesfully having obtained their own goal. But this was not the road to be travelled. Enters the Outer Circle to whom “peace in Yugoslavia” is an oxymoron. Guided by the same unfortunate ideas of chosenness, glory and trauma as many Yugoslavs, they love “crisis”. It means that the country, the whole region is up for grabs. The key question: What is in it for me? Germany-Austria-EU: These are three actors, not one. But Germany can be seen as the defining power for the Eastern- Southeastern foreign policy of the European Union if we assume that the EU is a political Common Market in addition to an economic Common Market. Thus, Germany might support Spain and France in Maghreb over Saraoui, Ceuta-Melilla in Morocco and Islamic issues in Algeria, on the condition that Spain and France support Germany in Eastern Europe over how to get access to Schlesien-Pommern in Poland and the Sudeten in the Czech Republic, through EU membership for the two countries, and more influence in former Yugoslavia. Austria would be particularly concerned with the Northwestern part. – to use the breakdown of Yugoslavia to build an EC/EU joint foreign and security policy, as the peace-maker stopping the violence. Not to use the UN or the U.S. They got most of this, with the exception of the last point. Russia: the “natural, normal” inclination for Russia would be to support their brothers and sisters among Orthodox Slavs, the Serbs in this case; expressed through nationalists like Zhirinovsky. But the Russian state was not in a position to follow up what national logic dictated if for no other reason simply because of its vulnerability as a major world debtor, with a recent history of having suffered a steep legitimacy decline. Their role, hence, was reduced to trying to soften the pressure on the Serbs, being their spokesmen on some occasions, and accumulating insights in how the “New World Order” is slanted against Orthodox Slavs. With some old dreams about access to Adriatic warm oceans. Conclusion: in favor of Croats and Muslims, against Serbs. But let them hurt each other first to beg for intervention. United Nations: in security issues the UN is not what the Member States make of it but what the Security Council makes of it (Article 12), particularly the veto powers, and even more particularly the USA, backing up its many positions with cultural power (having done their homework, right or wrong), economic power (withholding UN dues, debt-management for political ends through the Bretton-Woods institutions (29)), and military power (brutality combined with smart weapons to eliminate enemy logistic capacity). But the USA was in the beginning less interested in the issue; possibly because of the “ground war complex”, possibly because of division of labor with the EU (regionalization of hegemony), and left the issues to a soft US mediator like Cyrus Vance. However, the UN Secretary General until the end of 1991, Javier Pérez de Cuéllar, had an image of what was needed (30). “In his report to me today, Mr Vance has described widely expressed apprehensions about the possibility of premature recognition of the independence of some of the Yugoslav republics and the effect that such a move might have on the remaining – – – the possibly explosive consequences of such a development – being a potential time bomb.- – I believe that the Twelve were correct when they reiterated – that – recognition “can only be envisaged in the framework of an overall settlement…”(31). Wise and prophetic words (34). Take the time needed, do not favor any party, develop a plan for all of ex-Yugoslavia. But Genscher went ahead with the catastrophic decision of the night of 15-16 December, echoing the German/Austrian/EU (35) goals outlined above. And in the place of de Cuéllar came Boutros Boutros-Ghali, urging that priority be given to Somalia/Africa. Yugoslavia was effectively taken off the UN map for decisions about war or not. The Media. Of course there are variations within the Fourth State Power. But by and large dominant media will support the foreign policy goals of their home State, and of the Capital they depend on, and vice versa. Nine hundred years later those fault-lines dividing Europe in three parts still define how a conflict is to be defined, and the cognitions and emotions. The central European power, Germany, had been historically correct: their enemy was Russia, whether Slavic-Orthodox or Communist, run by Tsars or Red Tsars, in World Wars I and II, and in the Cold War. And the enemy was Serbia, Slavic-Orthodox or Communist, in World Wars I and II, and in the highly polarized Cold War. – they were homologues to Russia in the Cold War. A major problem: dominant Western media had similar mind-sets for Muslims. Whom to hate more and understand less, Orthodox or Muslims? Another tendency is to reduce conflicts to two parties. Three parties, like in B-i-H or the Croat-Titoist-Chetnik triangle, cause deep cognitive and emotional problems. Better simplify. A new actor has entered the news chain as event-maker, not only news-breaker: public relations agencies with States as clients (38). They manipulate news in favor of their clients and against their enemies. They construct virtual realities by planting as news non-events like the incubator story in Kuwait 1990 (by Hill-Knowlton (39)). Question: What achievement were you most proud of? Question: But when you did all this, you had no proof that what you said was true. You only had the article in Newsday! Question: Are you aware that you took on a grave responsibility? In the right-hand column are a number of narratives, stories waiting to be told. They are all important in any effort to understand what went on. But the media over-selected the narratives to the left at the expense of the narratives to the right. The argument is not that what is to the left should not be covered, but that what is to the right should also have been given a clear voice, a glasnost’. The image created was that only bad events, with no history, just “nationalism”, happened in Yugoslavia. The idea of “ethnic conflict”, with no context in time or space, serves that purpose. Outside actors are only spectators, trying to help. The base-line narrative was Serbian atrocities, omitting that the first shots fired were by Slovenes against Serbian border guards, and discrimination against Serbs in Croatia. “Greater Serbia” was played up, Greater Croatia not, nor Bosniak visions. The suspicion of Russia was given ample space, dubious acts by the West not. The conflict is seen in terms of nations, no attention to class and generation, some to gender. All good initiatives were seen as coming from outside elites, not from inside Yugoslavia, nor from people in general. A self-serving, totally inadequate, Western story (44) with the underlying script, the deep text, in the underlying assumptions. The Media have become a major conflict actor. And the goal: more war. Complex. What is the basic issue? Like a history of unprocessed conflicts? Or of cynical leaders instrumentalizing those conflicts? Or cynical outsiders instrumentalizing those cynical leaders? As a minimum, all three into one. They are not mutually exclusive. I had just been appointed Director-General of the Inter-University Centre in Dubrovnik, Croatia, to help build an academic meeting place for universities West, East, North and South. In other words, the university parallel to the foreign policy of Yugoslavia. And the scene is the first meeting of the IUC Council. Among the items on the agenda were such matters as the academic program for the opening term spring 1974, and how to share telephone and postal, PTT, expenses. Deep silence. Everybody looked down. High up in a corner, close to the ceiling on a picture, Tito, handsome like a young actor, looked down upon us all, including the sinner who had committed this gaffe. The meeting resumed the discussion of the final points under PTT expenses, the relief being visibly present in the body language of them all, and the session was adjourned. A self-appointed wise man from Zagreb came up to the uninitiated Director-General from the North and said, “never ask that question again. The situation is very, very bad”. Indeed. Among the many figures quoted, maybe the Croats killed 600,000 Serbs, with the Jasenovac concentration camp being a major killing field, and maybe the Serbs killed 300,000 Croats in retaliation. And then it was called off. Tito declared an end and the beginning of a new era, the era of Brotherhood and Unity, bratstvo i jedinstvo, the name of a bridge located in the very epicenter, Sarajevo. It doesn’t work that way. This is not the place for the theory and practice of reconciliation, but some points must be made. The past has to be “processed”, a terrible word, but it has some meaning. We cannot let the past poison present and future like a festering wound. Another metaphor is “cleaning up”, sounding like a clean slate, like an invitation to collective aphasia, forgetting it all. It is impossible, meaningless. A better term is reconciliation, reconciling ourselves to what happened, not forgetting, nor forgiving (which means demanding very much from the victims), but acknowledging fully what happened and somehow agreeing to close that chapter or book in the relationship, opening a new one. In other words, closing the past in order to open the future. “Removing the past from the political agenda” is another formula, all the time under the condition that the perpetrator does not do it again. In principle the closure should have some healing effect, and vice versa. It’s about recognizing that there can be no denial of what happened. The minimum any victim demands is not apology or compensation, but acknowledgment of what happened with no denial, no obfuscation. It is the denial that drives the victim crazy and there had been much of that on all sides. Yugoslavia entered the Titoist period with an unprocessed past. The topic was taboo, no truth, no reconciliation, none of the many approaches to reconciliation was used. The festering wound was kept festering and fueled the new conflicts in the wake of the dissolution of the Socialist Federal Republic of Yugoslavia. To open that wound to clean it would have been very painful, and it was never done. So lust for revenge blended seamlessly into the effort to hit and harm the other side to prevail, adding to the already overfilled reservoir of trauma. And still, at the time of writing this, nothing is done, auguring very badly for the future. 1. B-i-H = Bosnia-Hercegovina (i = and). 2. The term “Bosniak” will be used for the Slavic Muslims of and in B-i-H, Bosnia-Hercegovina. Most media and politicians used religious denominations for them (“Muslim”) and not for the Serbs and the Croats, in line with the general Western tendency to see Muslims as more violent than the Christians. Almost never was Serb and Croat violence described as “Orthodox Christian” and “Catholic Christian”. Terminology in this field, however, is problematic, but “Bosnian” would cover all three. 3. Self-management, of the organization, meaning, among other things, general assemblies of everybody working in an organization. One formula I found useful was “micro-socialism in a setting of macro-capitalism”, but regardless of formula this was also an effort to define a middle way, like in foreign affairs. 4. With links to the West though, the “secret” pacts from 1954 about cooperation in the defense of Italy should the Red Army attack through Hungary. 5. I would like to use the occasion to pay tribute to Leo Mates, the Secretary General of the Conference, an highly gifted and dedicated political analyst and practitioner. 6. This, at last, was one major factor; in addition to economic problems, political antagonisms and machinations of outside powers. Among the economic problems was certainly also US pressure: “Despite Belgrade’s political non-alignment and its extensive trading relations with the European Community and the US, the Bush Administration was nonetheless intent upon dismantling Yugoslavia’s “market socialism”. Washington’s strategic objective was to integrate the Balkans into the orbit of the “free market” system” (Michel Chossudovsky, “Dismantling the Economy of Former Yugoslavia”, Alternative Forum to The European Summit, Madrid, December 11016, 1995, p. 2). 7. The anti-Serbian bias in the West has focused on Milosevic’ speech 28 June 1989, addressing more than one million Serbs, marking the 600th anniversary of the Battle of Kosovo. The very nationalist Croat Spring 1971 is not mentioned, nor that the quite fundamentalist Izetbegovic’ “Islamic Declaration” was first published in 1970. One possible explanation is that they at the time were seen as revolts against “communism”, hence legitimate. 8. To the famous quip (Seton-Watson) “more history than they can digest” let us add “more chosen peoples/km2 than is good for health”. 9. This combination of Chosenness, Myths and Trauma is what I elsewhere refer to as the CMT-complex; a particularly vicious combination leading to collective notions of megalomania (C and M) and paranoia (T). See Johan Galtung, Peace By Peaceful Means (London, Thousand Oaks, New Delhi: 1996), Part IV, Chapter 5, “Are There Therapies for Pathological Cosmologies”, pp. 253-264. For the view of a US military man, General John Galvin, NATO Commander, in charge of Westpoint Military Academy, see Mershon Memo, Ohio State University, Winter 1995: “These groups could have continued to live as neighbors if there had been a higher power maintaining order, if there were a policeman on the block who says: “Let’s have no trouble here”.” In other words, very weak or no understanding of history combined with the “law and order from the top” view, practiced by the Ottomans, the Habsburgs, the Nazis and Tito. John Galvin was adviser to the Bosnian Muslim government in Sarajevo when (May 1995) “the Muslims fell into a classical military ploy”. The Bosnian Serbs enticed them into a large valley by retreating rapidly as the Muslim Special Forces pressed home their attack. When the valley was full of Muslim troops the Bosnian Serbs opened up from the surrounding hills with heavy artillery, mortars and machine guns. According to one-colonel- “It was a slaughter.” ” (Car, op.cit, p. 22). 10. The famous Kremma prophecies “of two illiterate Serbian peasants are offering a hope and a vision of redemption to Serbs”, see Branko Dimitrovitch, “Serbs Find Comfort in 19th Century Prophecy”, Global Times, June 17 1995, p. 6. Also see “Serbien ist Gottes Werk”, Der Spiegel, 23/1995, pp. 130-139 for a review of Serbian history in the light of myths. 11. More particularly, the Serbs should not demand of the Croats in Krajina what they are not willing to grant the Albanians in Kosovo/a; taking into account that the settlement of Serbs in Krajina is older, taken the quantity into consideration, than the settlement of Albanians in Kosovo/a. Thus, “Kosovo, to the south, was also detached /from Serbia, by the Nazis/-its Serb ethnicity diluted through expulsion of about 200,000 Serbs and importation of over 300,000 Muslims from Italian-occupied Albania” (C. G. Jacobsen, “Yugoslava’s Successor Wars Reconsidered”, Ottawa: Carleton University, 1995). 12. Around 57% according to the 1991 census. 13. To this could be added the Catholic/Protestant fault-line relative to the five or so Protestantisms coming out of Renaissance Catholicism. But after the Peace of Westphalia 1648 this fault-line has been cold (with the exception of Northern Ireland). The Cold War placed four countries wrongly: Protestant Eastern Germany, Catholic Poland, Protestant-Catholic Czecho-Slovakia and Catholic Hungary were in the “socialist East”, under Soviet/Russian control; and these were, of course, the four countries were anti-Soviet revolts erupted (1953, 1956/80, 1968 and 1956). 30. In a letter to the German vice-chancellor and foreign minister at the time, Hans-Dietrich Genscher, of 10 December 1991. 34. As a general rule people further removed from Yugoslavia, like a de Cuéllar and an Akashi (“UN Bumps Its Envoy”, IHT, 11 October 1995, “for his reluctance to use military power”) often had much better judgments, possibly because they knew that they did not know. The diplomats from Western Europe did not even know that, particularly those with “experience from the Balkans”, meaning invading and meddling (Austrians, Germans, Turks; to some extent also English, French and Italian diplomats). Experience as big power in a region deforms the mind deeply. 37. By foreign ministries and some academics. 40. “Manipulating the Media”, Intelligence Digest, 4 February 1994, pp. 3-5. 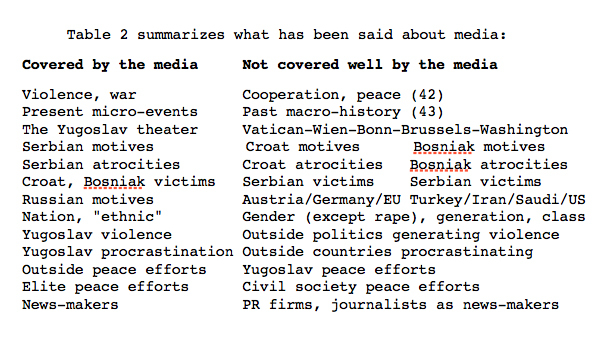 For an analysis of “The Media in Serbia, Croatia and Bosnia-Hercegovina”, see Mark Thompson, Forging War (with that subtitle), Institute for War & Peace Reporting, London. 41. The media do not seem to have Hill & Knowlton and Ruder-Finn filters to weed out planted virtual reality like incubator stories, false testimonies, hired demonstrations etc. The enormity of the problem has not penetrated the media. There have been no massive protests or investigation; no call for self-control, possibly because the media are well paid. Of course, there are critical voices inside media mainstream, such as the Columbia Journalism Review, trying “to assess the performance of journalism”. But this kind of work is at best based on spot checks, not on systematic monitoring (also see The St. Louis Journalism Review). The series CENSORED (like the 1994 edition by Four Walls Eight Windows, New York) also performed a valuable service, but again there may be doubts about how systematic the work behind such efforts is. No intelligent person trusts what an intelligence agency cares to leak, so why should media be trusted, particularly if they are also on a pay-roll? Better trust internet sites that bring together reports from named, independent journalists, straight from the field. No anonymous reports should ever be trusted.